When you Google “Hartselle, BBQ”, there are two places that show up. 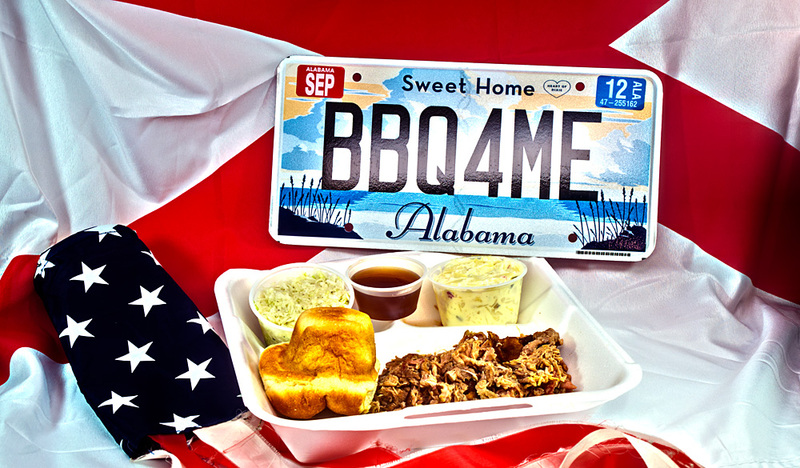 But there is also a third place that somehow does not register with Google – Pig Stand Bar-B-Que. This is rather unfortunate, because this place is way above your average BBQ joint, even by the lofty standards we here in North Alabama are accustomed to. My wife and I spotted this place when we drove home from a visit to beautiful downtown Hartselle, on Highway 31 towards Decatur just outside of town. And I came back two days later to check it out. With its red roof that resembles a barn, white windows and brick walls, the building looks very country-esk. Inside, there is a window in the wall where you order, pay and pick up your stuff, and right next to it is a white board where you find the daily specials. 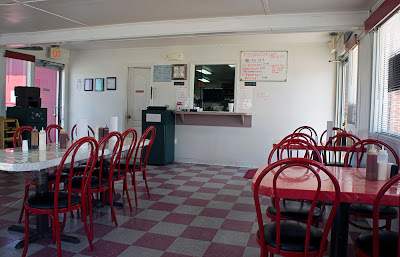 The red checkerboard vinyl floor and the red chairs and alternating red and white tables have a distinctive 1950s charm. The dining room furniture seems to be fairly new and everything is well maintained and spotless clean. It is a very nice atmosphere to dine in, brightly lit through the big windows at the sides, and there is space for maybe thirty people to sit. 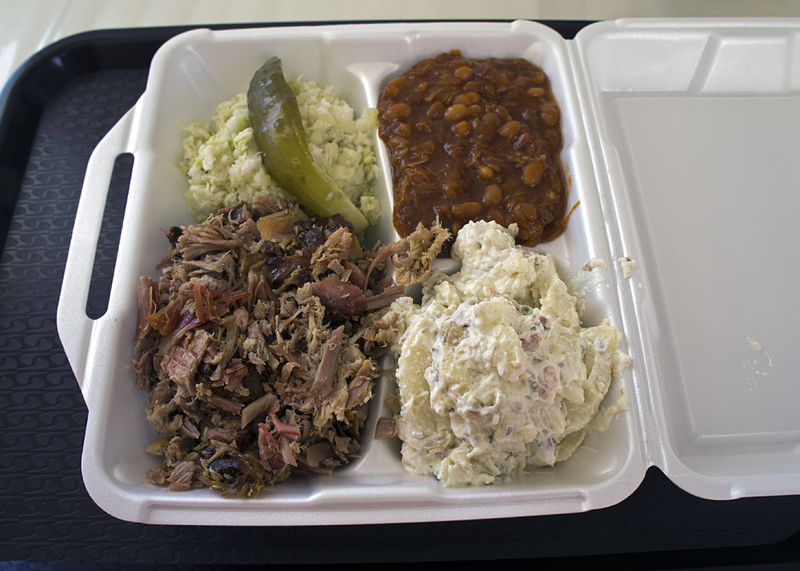 As usual, I ordered the pork plate – large this time, because I was really hungry – which comes with the three sides of slaw, potato salad and baked beans. The pulled pork was very lean and tender, a bit on the dry side, but the taste was just wonderful. It was a very well balanced combination of meat flavor and smoke aroma and clearly was one of the best BBQ meats I ever had. There is really no need to pour sauce over it to enhance the flavor, but since they have them on the table, I just tried them. The red thick dark red/brownish sauce is very fruity and somewhat spicy. The clear vinegar based pepper sauce is not exactly sour, but tremendously hot. There is clearly more than the standard black pepper in it, and I thought that I saw some red chili flakes in there too. Mixed together, I ended up with a rather spicy conglomerate, which was still very spicy, but was more to my liking than those two sauces by themselves. As for the sides, the killer here is the BBQ beans. Very savory, not really sweet but with some actual meat in them – that is the way you do beans! Unfortunately, the potato salad was going in the same direction, with a distinctive bacon taste – not my favorite, I like the sour variety better. That I had with the slaw, which marinade was vinegar based and quite sour, yet with a strong hint of sweetness. All together, the mixture of hearty, sour, smoky, and sweet flavors of the meat and the sides works very well together and lets Pig Stand Bar-B-Que stand out of the crowd. Too bad that Google, and so I guess the rest of the world, does not find the place. But take my word for it and drive there when you are in the neighborhood – sometimes, having to share such a great place with the world isn’t necessarily a good thing.